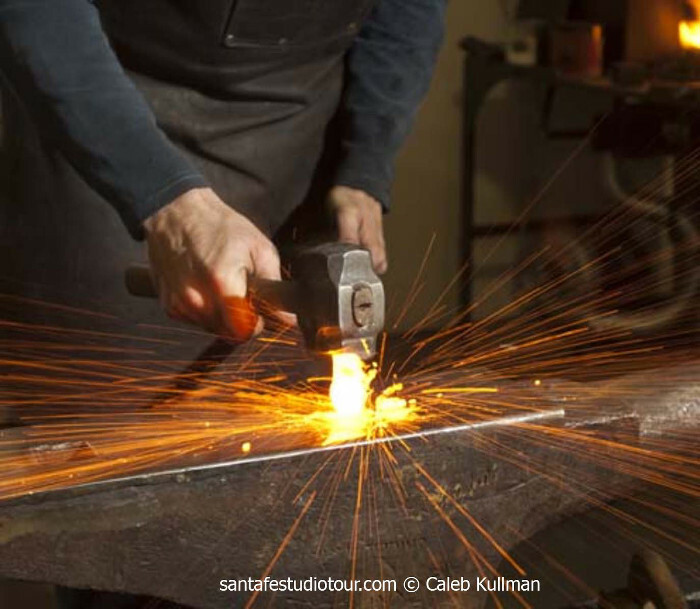 The Santa Fe Studio Tour is a point of pride for our City Different, and one of the top things to do in June. 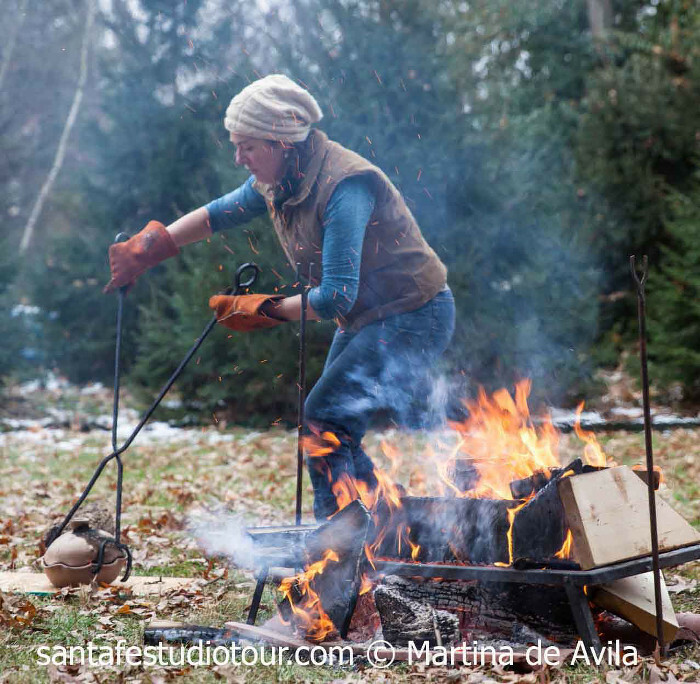 If you want a fresh, immersive experience that brings you into the world of artists’ private studios, and reveals insights about techniques and inspirations of some of Santa Fe’s top artisans, while exploring Santa Fe – then the Santa Fe Studio Tour is a must! 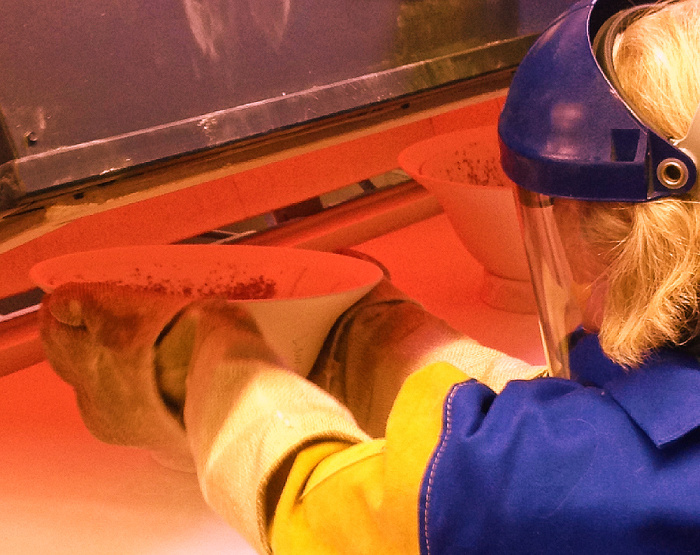 The Tour is self-guided, and all events are free. It is a great way to explore neighborhoods throughout the city, and immerse yourself in a world of beauty and creativity. The Studio Tour itself takes place June 16th & 17th and June 23rd & 24th, 2018. Artist Studios are open from 10am to 5pm. There are many other fun community events planned for the weeks leading up to the tour (see below for a list). Grab a Planning Guide, either in print or download one here, and plan which artists you’ll want to visit on each day. Plot their locations on the map or use the Google Maps link: santafestudiotour.com/the-tour. You’ll see artists in action, working in all mediums — sculpture, clay, jewelry, painting, fabric, textiles, metals, glass, and many others. I always find it inspiring to interact with artistic creativity on a level that isn’t available in a gallery environment. 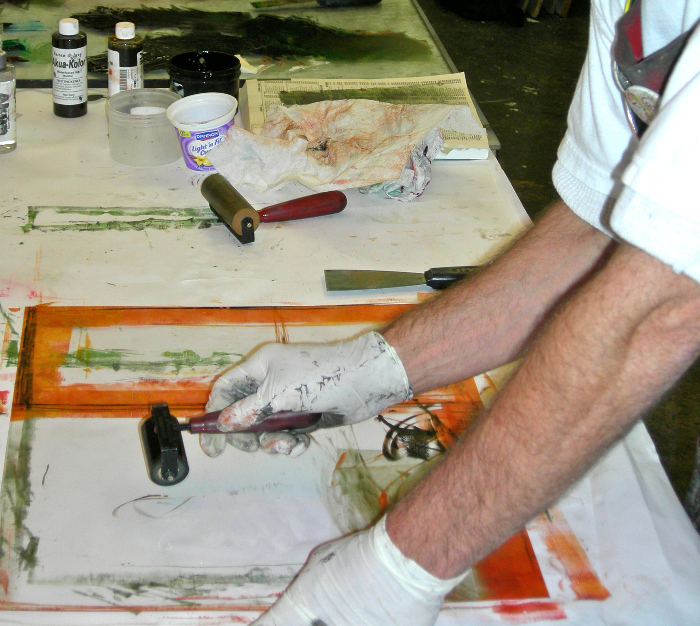 Ron Pokrasso – rolling ink onto a monotype plate. #17 on tour. Santa Fe Studio Tour Community Events All community events listed below are also free to the public, and will be held at the Community Gallery in the Tourism Convention Center at 201 W. Marcy St.
Friday, June 8th. 5 – 8pm: Exhibit Opening Reception. The exhibit will feature one piece from each of the tour’s participating artists. This exhibit continues through June 27th at the Community Gallery. Hours: Monday – Friday 10am – 5pm, Saturday – 8.30am – 4.30pm. Closed on Sundays. Saturday, June 9th: 1 – 4pm: Community Family Fun Day. Offering interactive art activities for all ages: Fun with clay, quick draw portraits, a community canvas, exploring powdered glass, food, fun and more. Caleb Kullman working with steel. #45 on the tour. 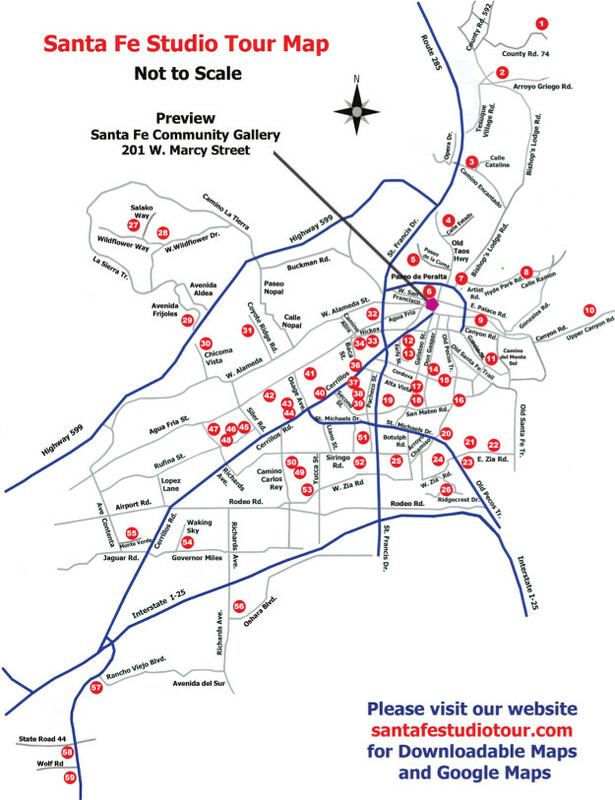 The Santa Fe Studio Tour Planning Guide makes it easy to plan your tour weekends. While driving, you’ll notice the Santa Fe Studio Tour numbered signs guiding you to listed locations. The printed guide is available at Santa Fe Tourism visitor centers, hotel lobbies, and at the Tourism Center visitor information main office at 201 West Marcy St. You can also request a downloadable map and Planning Guide by going to this link. Click this image to get a downloadable map and planning guide emailed to you. 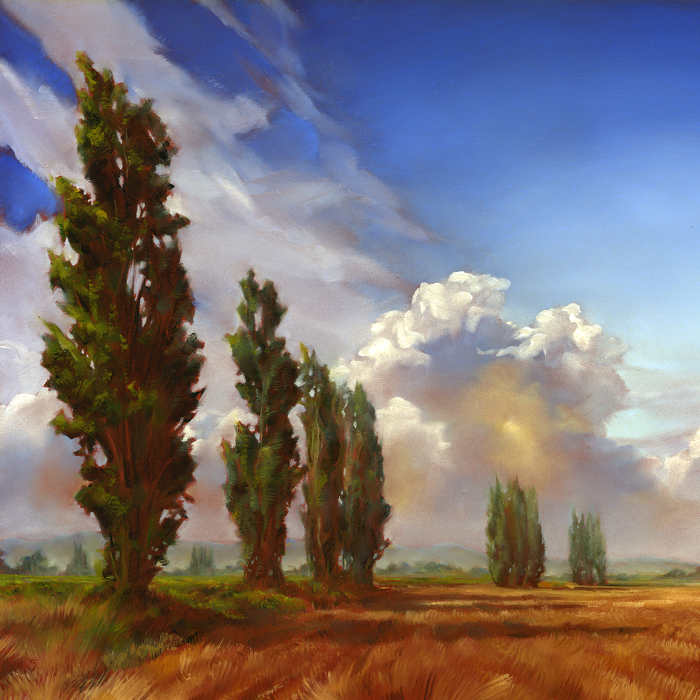 What began as a grass roots effort back in 2006 now has as many as fifty-nine studios and seventy-six artists participating. This unique experience was founded twelve years ago by a collaboration of only a handful of local artists; Bill Jackson, Darlene McElroy, Teena Robinson and Dave Robinson were the key figures. The first year saw only eight studios on the map. Initially, artists opened their studios to the public twice a year. In 2009, the group decided to focus their efforts on a once-a-year show. Towhee Nest with Jimson Weed. Acrylic on Canvas by Liza Myers #43 on the tour. Thanks to the hard work of the dedicated founders and volunteers, the tour began to gather momentum. In 2017, tour artists formed a committee, under the direction of artist volunteers Ricardo Gutierrez, Erica Elliot, Becca Haffenden, Cindy Fry, and Melinda Silver. Congratulations are in order to the founders and the many volunteers that have pitched in since its inception; now, The Santa Fe Studio Tour has formed an official 501c3 non-profit entity. Summer Harvest by Colin Poole #3 on the tour. With such determination and dedication of its volunteers, The Santa Fe Studio Tour has expanded in size and increased its event schedule. It is an established “destination event”, that brings people to town from all over the state and country during a beautiful time of year. And it draws the attention of collectors and gallery owners from around the globe to our local artists. Many of the original artists remain in the tour, and new talent joins each year. It’s a top favorite thing to do in town in June! Join us! Laura Fram Cowan – Glass Kiln Works. #23 on the tour. For more information on Santa Fe, and where to stay, eat, and play, go to SantaFeSelection.com. This entry was posted in All Posts, Santa Fe's Best Tours, The Arts, Things To Do, Things to do for Kids, Top Santa Fe Galleries by Maria Johnson. Bookmark the permalink.